so you can redefine your life. Learn more about your wealth satisfaction levels to see where you can improve. 1. Rate each category by your current level of satisfaction as high, neutral, or low. 2. From these categories, what are your three areas of greatest wealth? 3. From these categories, what are the two areas that need the most improvement? These ratings provide an assessment of how fulfilled you feel in each dimension of your life. Think about your assessment and where you feel the most fulfilled and where you could deploy more energy. Do you need help feeling more fulfilled in certain areas of your life? We can help you build a plan. Taking into account what is most important to you, what you are best at, and what you have trained for. Let’s discover your Inspired Life Purpose. Refer to the figure above for the next assessment. You can just use your own pen and piece of paper. 1. GIFTS: List out your innate talents/gifts; what comes easily to you. 2. SKILLS: List your knowledge/skills, life experiences, education, and training that has prepared you for life. 3. PASSION: List what you would be doing if you had all the money, support, and motivation you needed. 4. TRENDS: List a major trend or trends you see and what you believe the world needs most at this time. Looking at all of these areas, you will realize your inspired life purpose. What will you do to manifest it? 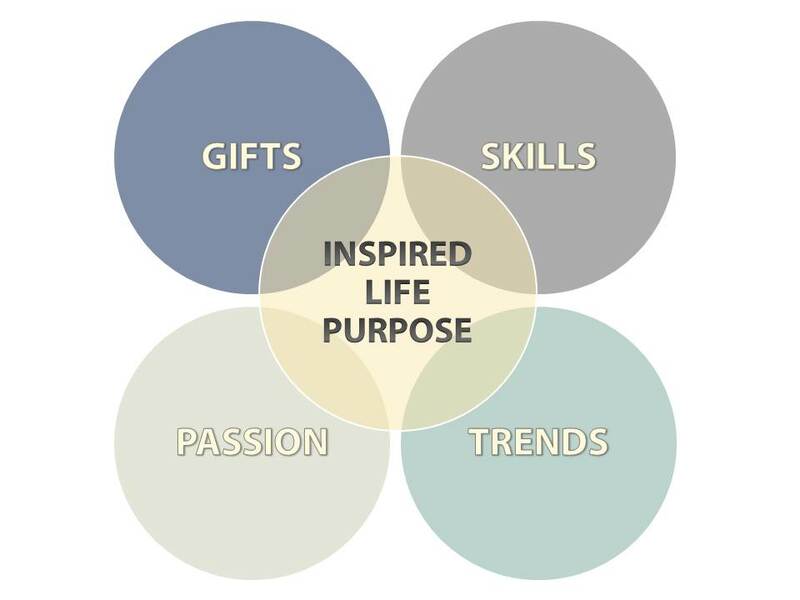 Do you need help defining your Inspired Life Purpose?